Vanilla scraps: Because I am going to be an aunty again..
...very soon, Trace was due on Sunday, I have decided to do a LO in honour of my little brother who is about to become a father for the third time. This is the Journalling, the story of how I thought Rob was Elizabeth. I was only 3 when Rob arrived on the scene. Michael and Geoff (Big brothers -ed) took full advantage of this fact when they ever so kindly informed me that I had a NEW BABY SISTER named Elizabeth (not very imaginative as this is my middle name). I was very excited although I am not sure when I came to realise that I in fact had another brother (and to be perfectly honest I preferred being the only girl..) Looking at him today I am sure he wouldn’t have made a very good girl. 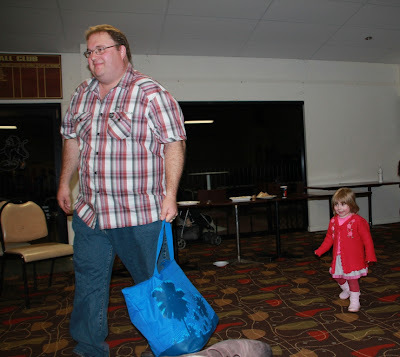 This is Rob now, being chased by his daughter, Holly (such a cutie). They are having a dt call at the moment, hmm could be good fun to apply, nifty sketch they have for the application anyway. And to finish off, a couple more LO's from the Cocoa Daisy crop (yes, never ending I know but the challenges were so very cool!!!). And I will have more another day - yep I have done 15 LO's in less than 10 days - a world record (for me anyway..). The challenge for this one is to use scrappy packaging on your Lo. 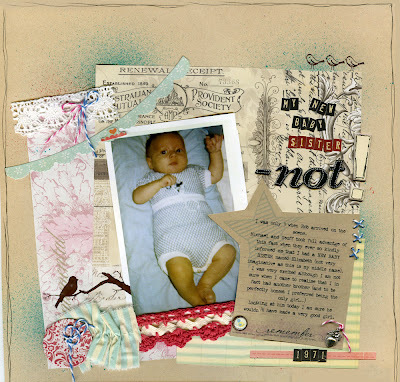 I find the Prima packaging is so yummy that it is easy to incorporate. For this LO when Henry was a baby - turned out really well I think. Time to get Henry from school, it has just started to rain here, after a really, really hot saturday (mid 30's already) the weather has turned cool again - not complaining. Don't forget to come and play with us at Another Freaking Scrappy challenge site - some really great prizes are up for grabs!! Great layouts, Karen!! I especially love the top one of your 'baby' brother! Awesome layouts, I am going to go check out the Krafty Challenge, sounds interesting. I will proper email soon, keep us updated on the baby news. Oh my goodness Karen - you sure have been busy. I love all your layouts, but especially 'Sunday Best' - well done. I had a whole list of challenges to complete in November and got absolutely NONE done! Great to see you haven't caught my "non-completion-itis".